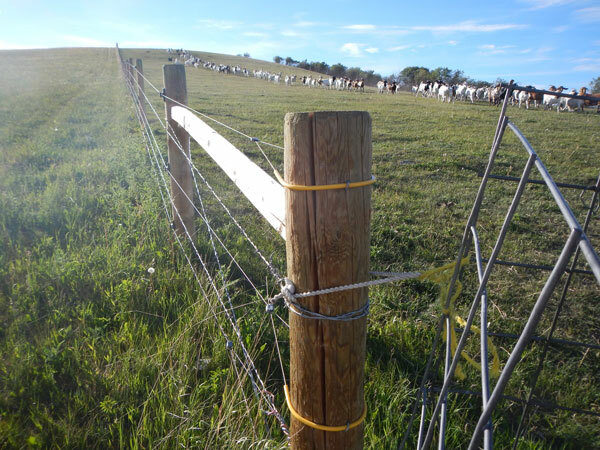 Bear Conflict Solutions assisted the C5 Ranch, east of Chain Lakes in Southern Alberta, erect a 6 strand electric fence on 55 acres to protect their herd of goats (as described in the second Waterton Biosphere Reserve report on Large Carnivore Attractant Management Projects in Southwestern Alberta 2013-2014). Janice and Kelly Cornforth manage the C5 ranch, east of Chain Lakes Recreation Area and northeast of Bob Creek Wildland Provincial Park in parkland and open grasslands. The high hills behind their home provide habitat for moose, elk, deer, and a whole suite of large carnivores, as well as grazing cattle and goats. Yes, goats. The boer-cross goats are kept purely as weed and brush control and to keep aspen and poplars at bay. The Cornforths do not milk their goats and aside from the billies (males), they don’t get sold at market. In addition to running a year-round goat herd, the Cornforths manage a commercial cattle herd for C5 Ranch and raise working ranch/cow horses. “We knew there were always grizzly bears in the valley but we’d never had any issues,” says Kelly. “For a long time, the coyotes were the only things that would hassle the goats and the guardian dogs could handle them. The cougars don’t seem to be an issue. And we don’t have the wolf numbers in here yet that they do just west.” But since goats have settled into C5 Ranch, bears have started coming in closer to the Cornforth home and outbuildings – and staying. In the summer of 2013, the Cornforths estimate they lost 20 head of goats. Of those, one was confirmed as a predator kill. “The government sent us a cheque for thirty dollars. It probably wasn’t even worth the stamp to send the cheque,” reflects Kelly. In the current predator compensation program, the valuation mechanism of killed livestock is not as standardized for goats and sheep as it is for cattle (changes made in 2015 have improved this situation). The market value for that goat in the fall would have been anywhere between $100-130 per head. The spring of 2013 “was like the beginning of things to come,” reflects Kelly. On separate occasions, several grizzly bears were seen in their barn-side pens with goat kids in their mouths. One night Kelly was charged by a sow grizzly while trying to get her to leave. Jeff Bectell, of the Waterton Biosphere Reserve, contacted the Cornforths about an electric fencing project to keep bears, as well as coyotes and wolves, out of their goat pens and pastures. Kelly appreciated the outreach. “In this situation we knew bears were living up [in the hills] so we needed something big enough and permanent. There were guardian dogs with the goats but it didn’t seem to matter. So [the electric fence would] take a little pressure off the guardian dogs and eliminate conflict,” says Kelly. The Cornforths worked with WBR to design a six-strand fence to contain 55 acres of goat pasture. Instead of adding all new wires to existing sections of fence, they used three strands of existing barbed wire for the “ground” wires and added three strands of stranded cable for the “hot” wires (Figure 14). In places that had old barbed wire fence, they replaced the posts and barbed wire. To provide power to the large fence, they hooked up a 110-volt charger to plug-in electrical service. Installing the fence took almost a month; planning where to put the fence took an equally long time. “Understanding the plan didn’t take long because we talked to the right people. But you have to think about where is the best place to put [the electric fence] for snow drifting, creeks, trees falling down,” says Kelly. So far, the Cornforths are happy with the electric fence. “The things that it can’t do, I didn’t think it could. When the snow drifts up, I never expected it to be able to handle that. But it’s a good design. It’s not cheap and it isn’t simple but it’s good,” says Kelly. Time to maintain the fence is “a little bit more than we thought. When [moose or deer jump over and] break the top wire it wraps around the barbed wire so it takes two people to fix it,” says Janice. Despite the higher maintenance, the Cornforths hope to electric fence another, larger section of land that needs brush and larkspur control. This would improve cattle pasture and also give goats more space to graze. “Our primary focus is cattle and horses,” say Janice and Kelly. With the addition of the electric fence, they can now spend less time worrying about goats. 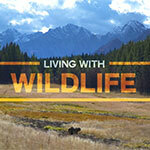 For more information about ranching and conflict mitigation projects, visit the Waterton Biosphere Reserve website.